marks typical of her age. She will come with a COA. Collector’s Club members may enter by lottery once per day up until May 7th, 2017. 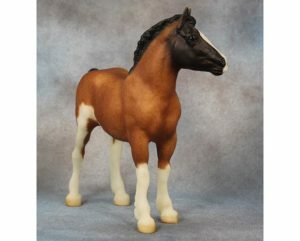 If drawn, the purchase price on the test color Clydesdale Foal is $650 + shipping. 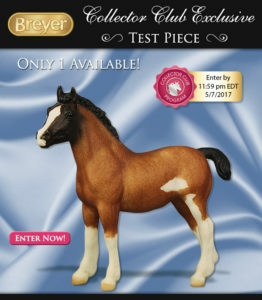 Personally, I’m not quite as wow’d by this piece as I have been by Breyer’s other test color lotteries. However, this foal is a fantastic piece of hobby history and I’m sure some collectors would be over the moon to have her. Will you be entering the test color lottery this time around? 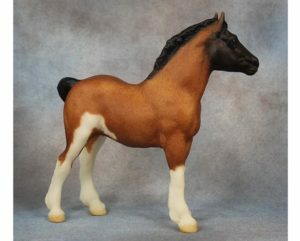 Breyer test run models are initial decos painted up to see how a particular color might look on a particular sculpture. Or, they may be created to test out a painting technique or new colorway. Not all test run models are used, and they may vary over time as different painting techniques are developed and tested. Test run models are sold as is, with several photos and descriptions of any wear. Each model has a fixed price and interested members enter a random draw for the ability to purchase the test piece. Only 1 test model is available at this time. 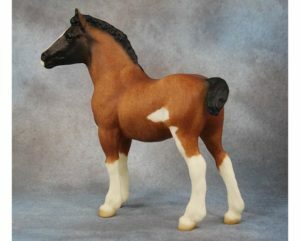 Introducing a beautiful bay roan Clydesdale Foal! This lovely test is vintage late 1990’s, and features tape mask sabino markings, fine splatter roaning and a darker shaded head. She has four extensive stockings on her feathered legs, and a pretty blaze face. She is a beloved older sample in our archive room, and it is time for her to find a new loving home so we can make room for new test pieces! There are a few dark marks on her white legs and face, which can be seen when you zoom in on the images. We’ve decided not to attempt to touch up older test runs as we’ve found that this can alter their character and uniqueness. 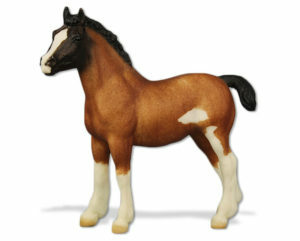 This test run Clydesdale Foal is priced at $650 and comes with a certificate of authenticity. See gallery of photos for more views of her coat color! 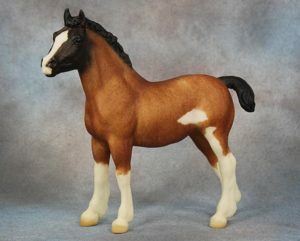 The Bay Roan Clydesdale Foal test piece is priced at $650 and comes with a certificate of authenticity. Only 1 piece is available for purchase. « It’s 2017 Kentucky Derby Time & We Have Racehorses!